The nature of work has traditionally been evaluated in terms of the 4 Ms of organisational resources, namely: Men, Materials, Machinery and Money. Incorporating these criteria, job grading systems have subsequently been developed to analyse the decision-making requirements of work in terms of know-how, problem-solving, accountability and stress. The goals of these systems are to inform job descriptions; to clarify accountabilities of role players; to map and align work roles; to improve succession planning and mobility within the organisation; to categorise jobs in terms of organisational structures and to determine compensation structures and pay scales. According to Beer (1972), complexity is the common factor behind the 4 Ms, as well as the criteria of knowledge, decision-making and responsibility. Work is thus about cognitively managing complexity and is the key consideration that should be used to describe and categorise work-related requirements. The complexity of work is described by the models of several theorists. Three such models which are widely applied within the organisational context, namely the Stratified Systems Theory (SST) of Jaques, the Viable Systems Model (VSM) of Beer, and the Information Processing Model (IPM) of Prinsloo. Whereas Jaques’ SST model primarily links social theory with the theory of organisations, Beer’s VSM is rooted in a holistic, Cybernetics approach to management theory while Prinsloo’s IPM refers to cognitive complexity and its implications for work performance. Prinsloo has integrated the hierarchical SST, the recursive VSM and the holonic IPM models in a holonic model of work complexity which is, for convenience sake, referred to as the IPM of work complexity. It addresses the interface between the cognitive preferences, capabilities and potential of people on the one hand, and the cognitive requirements of work, on the other. The holonic IPM of work complexity also reflects the structure of the SST and the VSM. Five levels of work complexity are specified, which range from Pure Operational to Pure Strategic work. Whereas operational work is clearly structured and tangible in nature, strategic work is ideas-based, intangible and dynamic in nature. 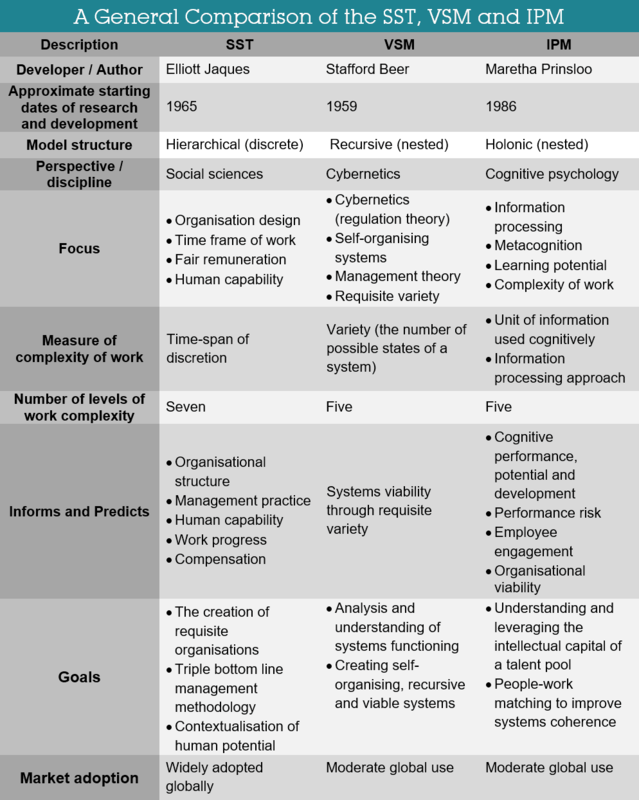 The text and tables below summarise the three models of cognitive and work complexity. 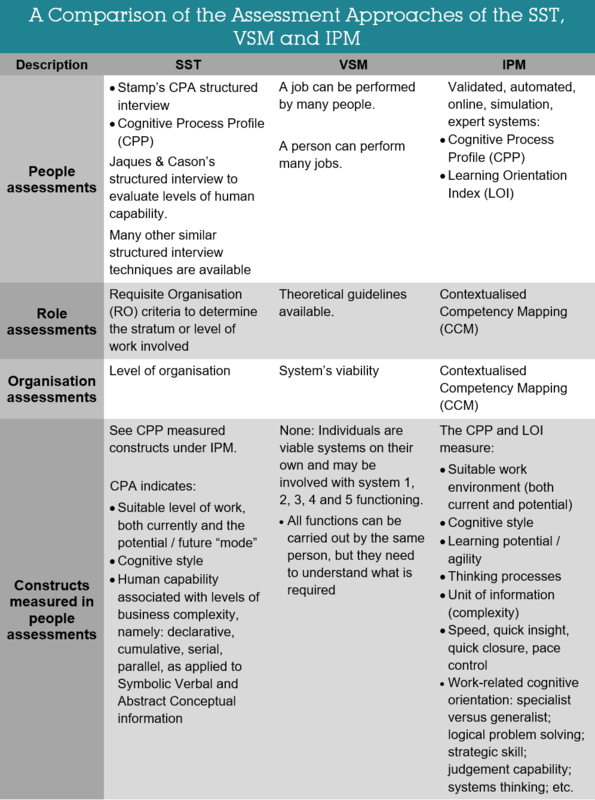 The IPM specifically refers to information processing competencies and potential, which inform the specifics of the cognitive requirements of work and therefore optimises the depth and quality of person-job matching and work performance predictions, as based on the IPM and the CPP assessment. The first three levels of work of the IPM, namely Pure Operational, Diagnostic Accumulation and Tactical Strategy, reflect the first three strata of the SST except that stratum 3 of the SST is referred to as Alternative Paths. The themes of these first three strata of the SST are Quality, Service and Practice. The structure of both the IPM and the SST also overlap with the VSM, covering the themes of Operations, Co-ordination and Audit. The fourth level of the IPM, namely Parallel Processing, overlaps with both strata four and five of the SST (namely Strategic Development and Strategic Intent), as well as level four of the VSM (with the theme of Direction and Planning). Level five of the IPM, overlaps with levels five, six and seven of the SST (Strategic Intent, Corporate Citizenship and Corporate Prescience) as well as level five of the VSM (the theme of Identity). The tables below show a general comparison between the SST, VSM and IPM to gain a general idea of the differences between the theories. The various models have differing assessments methodologies that have been developed for people, roles and organisations. The assessments given in the table are examples – they are not exhaustive. This blog is part of a series on models of work complexity, which includes “What is the Information Processing Model (IPM)?”, “What is the Stratified Systems Theory (SST)?” and “What is the Viable Systems Model (VSM)?”. “Absolutum obsoletum” which Beer translated as “If it works, it’s out of date”. This is now referred to as “Beer’s Law”. In contrast to the adage “If it ain’t broke, don’t fix it”, Beer’s law states that if it is working, then your competitors are already developing new features that will make your offerings obsolete. Thank you for reading Cognadev’s series on Models of Work Complexity. If you have any questions or would like to know more, please feel free to contact Cognadev using the messenger in the lower right-hand corner.